The Philippines’ gross domestic product (GDP) posted an annual growth rate of 6.5 percent in the second quarter of 2017, up from 6.4 percent in the preceding quarter. 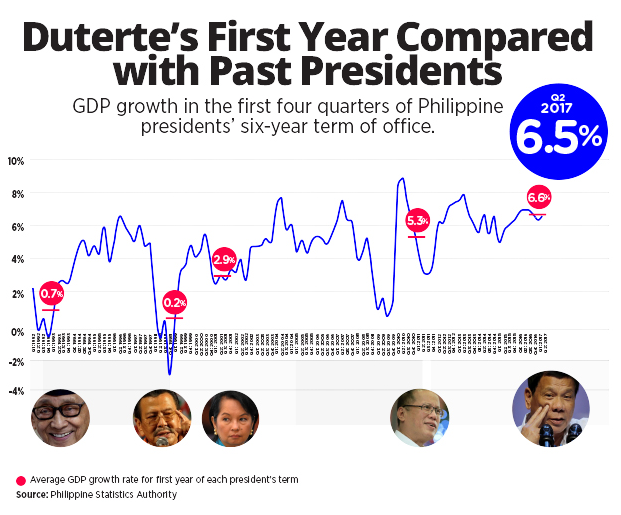 With that, average annual GDP growth under President Rodrigo Duterte’s first full year of power stood at 6.6 percent, the highest first-year average among the five most recent presidents. The rise in GDP, a measure of economic output, is often touted as one of the key accomplishments of any presidential administration. Incumbent presidents and their economic managers often compare how the economy is doing during their term with that of previous presidents. 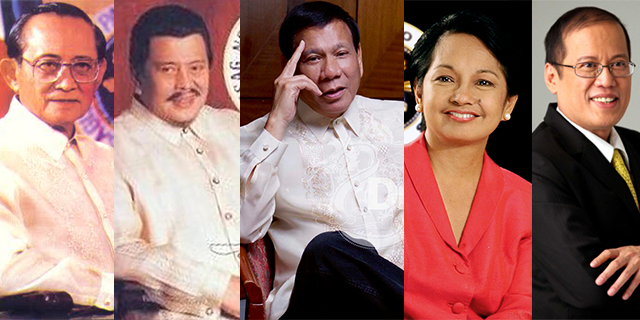 Averages for former Presidents Fidel Ramos and Joseph Estrada stood below one percent, while former President Gloria Macapagal Arroyo’s first year as president did a little better with an average GDP growth rate of 2.9 percent. While former President Benigno Aquino III’s first quarter of presidency had a higher GDP growth rate than President Duterte’s own, the lower growth rates in the three succeeding quarters left Aquino with an average of 5.3 percent. Check out the infographic to see how annual GDP growth rate has done throughout the five most recent presidents’ terms.